Chinese in Malaya in states like Malacca, Penang and Kelantan. Many Chinese Peranakan families in these states can trace their ancestors in Malaya back through eight generations. 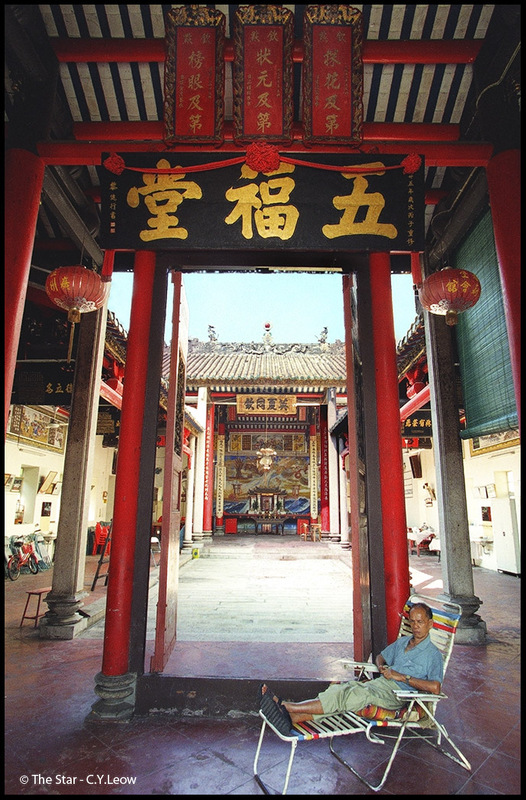 When Ming loyalists fled their country after the Manchu invasion of South China in the mid-17th century, many of them sought refuge in Malacca as there was already a Chinese settlement there. The opening of Penang in 1786 by Francis Light further attracted large numbers of Chinese traders, many of whom eventually became permanent settlers. 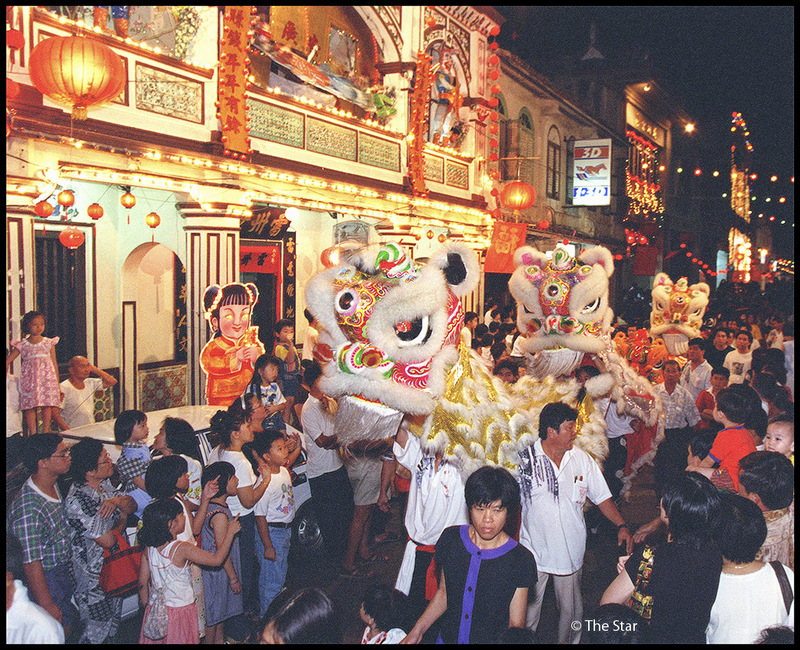 From then on, Chinese arriving in the Straits Settlements of Penang and Singapore grew steadily. 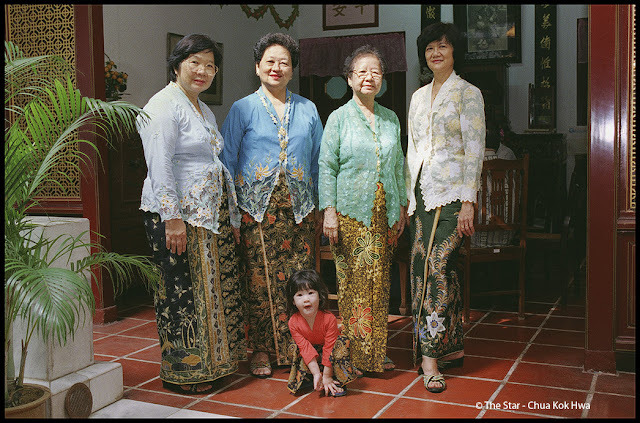 From this group, a discernible Chinese Peranakan community was formed as intermarriage or cohabitation between Chinese men and local women occurred. Beginning in the 1880s, Chinese labourers, mostly from the southern provinces of Fujian and Guangdong, were brought into Malaya to work in tin mines and plantations. 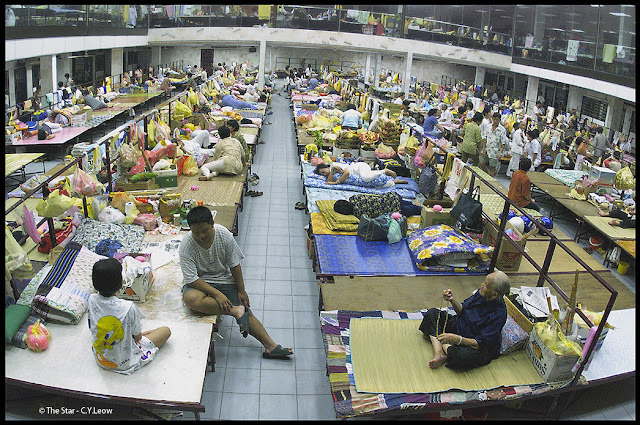 Nurturing hopes of achieving prosperity in the economically vibrant Malaya then, most had left their villages to escape abject poverty and hardships wrought by natural disasters and wars, exploitative landlords and heavy tax burdens. These Chinese immigrants had intended to seek their fortune and then return home. A few made their fortunes, but most led hard live . In time, especially after female Chinese were allowed into Malaya from the 1890s onwards, many decided to stay permanently and make their home here. Female Chinese immigration also reversed a growing trend of marriages between Chinese men and local women. More significantly, marriages between Chinese men and women helped to preserve Chinese identity and culture in Malaya. Although viewed as a homogeneous group - they looked alike, practised similar customs and shared the same religious beliefs - they, however, comprised different dialectal groups which in most instances were not mutually intekkigible. There were also clear-cut differences in the occupations under taken by each group. Five of the main ones were the Hokkiens, the Cantonese, the Hakkas, the Teochews and the Hainans. These groups were further divided into smaller subgroups, each with its own traits. The Hokkiens were mainly rice retailers, traders, agriculturalists, porters, petty traders, boatmen and masons while the Teochews were gambir and pepper planters, shopkeepers in rural areas, rice and cloth merchants, fishermen, and vendors in markets. The Cantonese were builders, carpenters, sculptors, masons, tailors, chefs and domestic servants. The Hakkas were tin miners, medicine men, blacksmiths, textile traders and pawn shop owners. The Hainanese were chefs and domestic servants. These sinkheh (new guests) in a strange land generally kept to their own dialect groups, while each group formed its own associations based on their place of origin in China. These dialect and clan organisations became the focal point of the immigrants- economic, social, cultural, religious and recreational activities. They also had their own temples, burial grounds and schools.These associations also offered social welfare services to its members: providing accommodation to new members, caring for the sick and burying the dead. Hence, there was no need motivation to seek contact with Chinese from other dialect groups. Furthermore, these immigrants had intended to return home, so it was deemed unnecessary to venture outside the refuge they knew. These entrenched social demarcations among the different dialect groups often led to misunderstanding, prejudices and conflicts and inter-group clashes frequently broke out in the late 19th century. Ironically, it was events unfolding in China in the beginning of the 20th century that united the Chinese in Malaya. It was while fostering a Chinese consciousness in support of revolutionary activities that the Chinese here learnt to settle their differences and began to function as a group. The anti-Japanese movement which was also very strong in Malaya also unified the Chinese here. Another development instrumental in the Malaysian Chinese community's homogeneous identity today was the introduction of hua yu (Mandarin language] as a medium of instruction in Chinese schools. Before this, instructions were given according to the dialect of the group sponsoring the school. The use of Mandarin became a unifying factor as Chinese from different dialect groups were educated together. The use of Mandarin for learning, social interaction and within the family eventually diminished dialect group identification. World War II accelerated the severance of ties between the Chinese here and China. After the war, there emerged a new generation of Malayan-born Chinese who harboured no attachments at all to the land of their forefathers. Before the war, there was little interest amongst the Chinese in the politics of Malaya. 1949 to voice the needs of the Chinese community and defend its rights, however, signalled the Chinese's active participation in nation building. MCA together with the United Malays National Organisation (Umno) and the Malayan Indian Congress (MIC) formed the Alliance which negotiated for Malaya's independence from the British. Under the constitution of independent Malaya, the Chinese was granted citizenship on the principle of jus soli, whereby all those in Malaya would automatically become citizens. Together with kindred communities in Sabah and Sarawak the Chinese now constitute about a third of Malaysia's population. Within the Chinese community, the 40 years since independence have been rife with changes. Divisions along dialect groups have blurred considerably due partly to the acceptance of intermarriages between members of different dialect groups. The Chinese today are at ease with the Malay language, and have assimilated the cultures of the multi-racial society they are part of. The Malay traditional costume, baju kurung, is commonly worn by Chinese women. Nasi lemak stalls and banana leaf restaurants count the Chinese as among their loyal clientele. While common cakes such as the love letters, kuih bangkit and kueh ros are enjoyed by all Malaysians regardless of their origin. 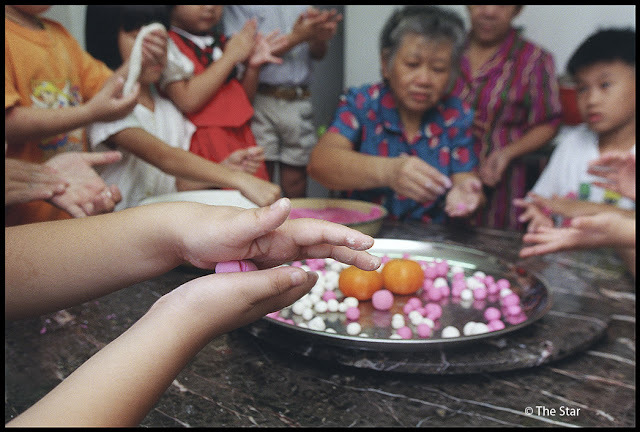 Other communities have also assimilated certain Chinese practices within their culture; the use of festive ang pow packets, for instance. Albeit with certain variations, Malays and Indians now have their own version of the famous red packet.Chinese cultural identity remains strong within the community, but its consciousness is innately Malaysian. 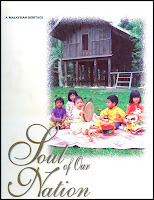 * Text taken from page 46 to 49 of "Soul Of Our Nation" under Chinese Community. as vegetables, dried tofu, dried shrimp, salted fish, groundnut or dried bean curd. These dishes reflect the lifestyle and hardship that the migratory Hakka group faced in China. They usually settle down in mountainous and less fertile areas where fresh produce was hard to find. Chong Choy Ngen, 30, owner of the Ho Poh Hak Restaurant in Jalan Horley, Ipoh is from the Ho Poh clan, a Hakka subgroup. He serves loi cha )ground tea) among other Hakka dishes in his restaurant. 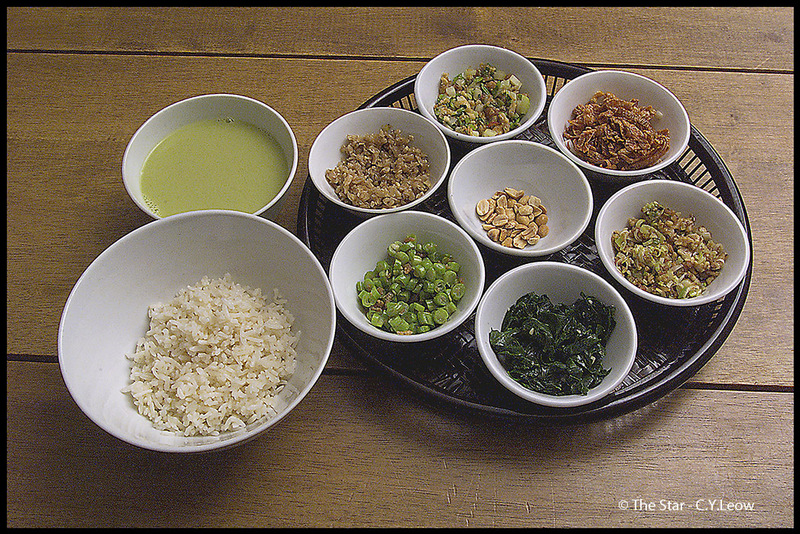 He learnt to prepare the dishes from his grandmother who migrated to Malaysia in the 1920s from Cahozhou, Guangdong, China. 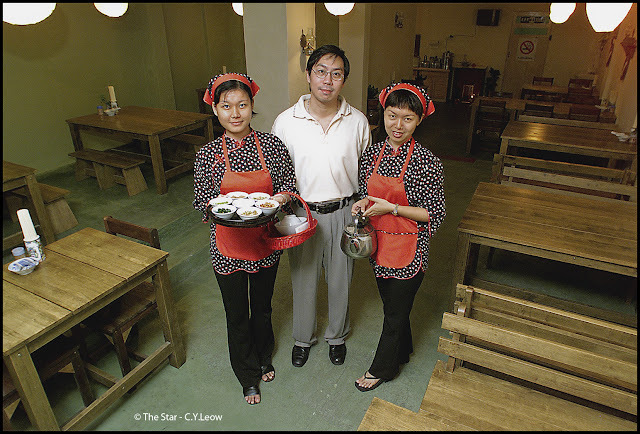 The waitresses are dressed in the traditional attire of the Hakka. 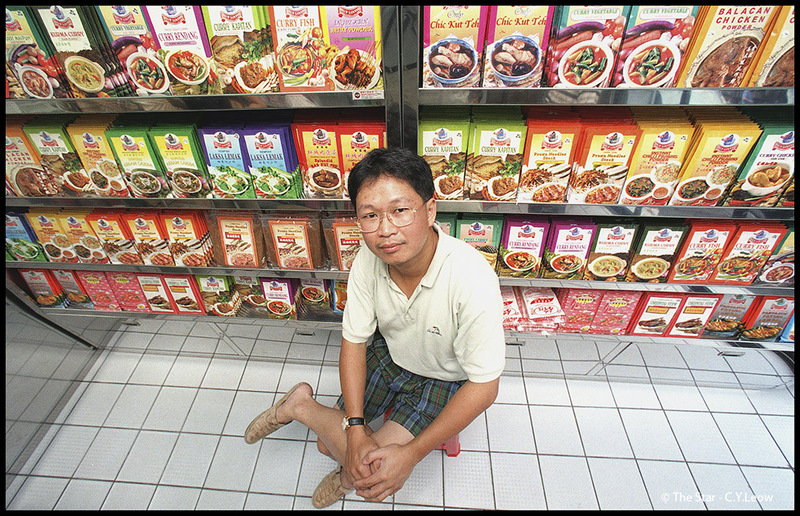 Although he is Cantonese, William Tham revels in the intricacies of the Penang Peranakan cuisine. A few years ago, the computer science graduated opted to close his family's provision shop and concentrate on marketing packaged ready- mixes. Hence, people everywhere could enjoy the delights of Penang cuisine. 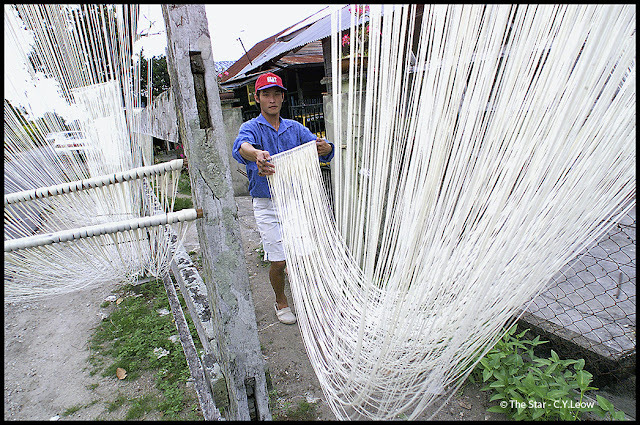 The textile retail business is an industry which ha been dominated by the Hakka in Malaysia for many years. 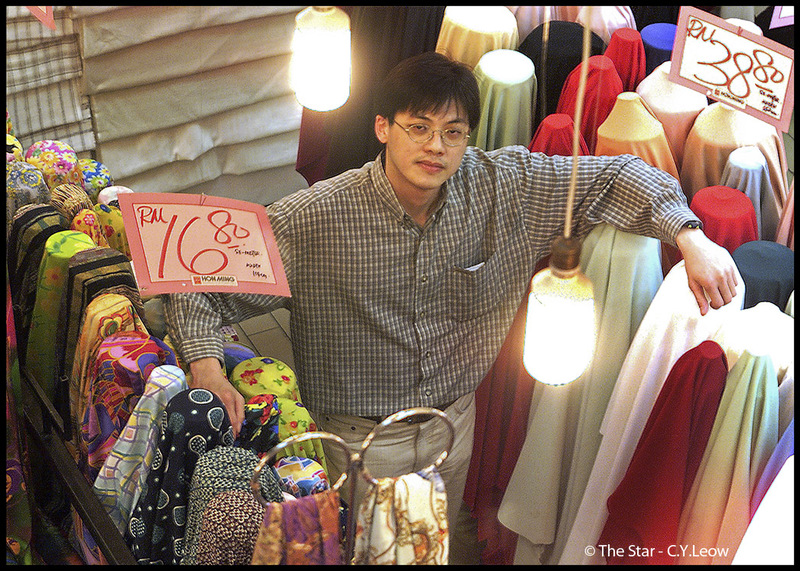 An example is Hon Ming Textile in Jalan Yap Ah Loy, Kuala Lumpur, a family business of over 50 years. Paul Chiew, a third generation Hakka, is the manager of the company which was founded by his grandfather Chiew See Fan, an immigrant from the Da Pu district in Guangdong province, China. Poll Ann Tong is one of the oldest medical halls in Georgetown, Penang. It continues to practice the Chinese ancient art of healing. 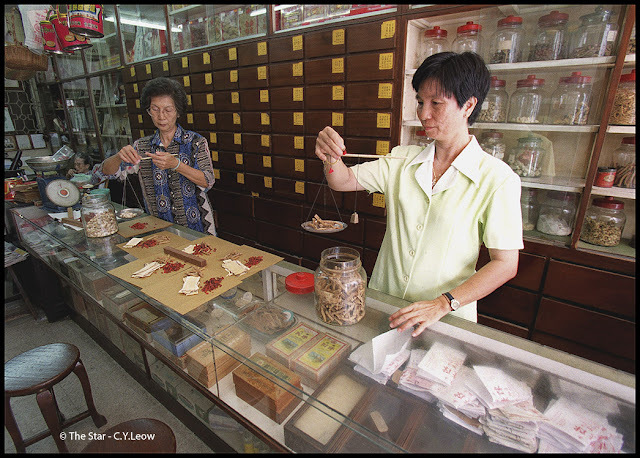 Chan Soo Sum (right) who graduated from the Chinese Medical College, Penang, first learnt about Chinese medicine from her father who set up the shop after World War Two. Chinese medicine goes back 3,000 years and is still revered by both the young and old. 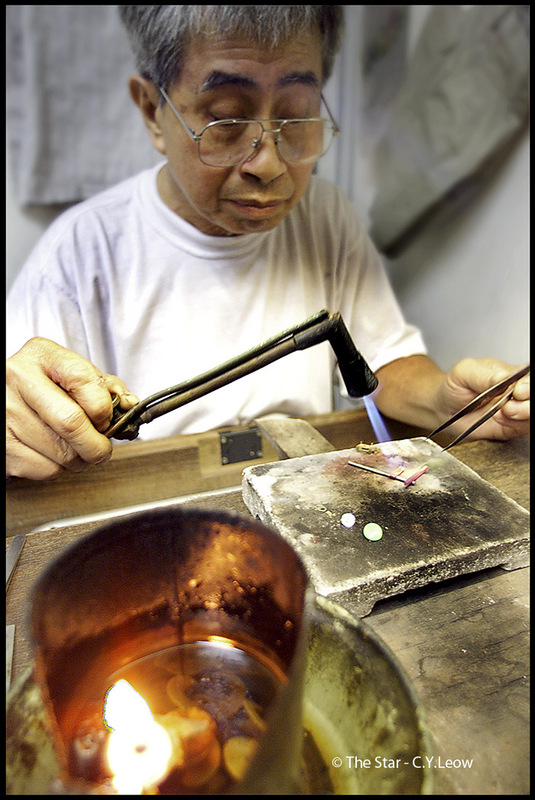 Goldsmith has been associated with the Cantonese for generations. A dying trade, there is now only a handful of the goldsmiths or skilled sifus around. Chow, 60, is one of them. 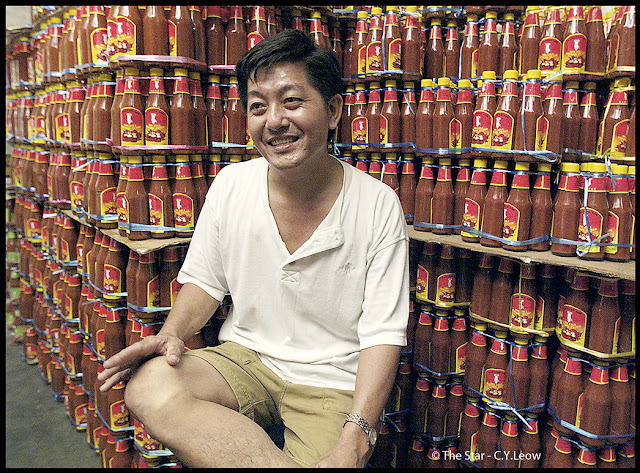 He learnt the trade from his father, who migrated to Malaya from Nam Hoi, Guangdong, and began his apprenticeship at the age of 16. He has been the chief goldsmith at Cheong Loong Goldsmith in Kuala Lumpur for a few decades. Fishing still plays a big part in the life of the Teochew community even though some of them have already ventured into business in the city. Originating from a port city in China called Chaozhou, most of the Teochews arrived in Malaya during the 19th century and early 20th century and settled near the sea in places like Sekinchan in Kuala Selangor. 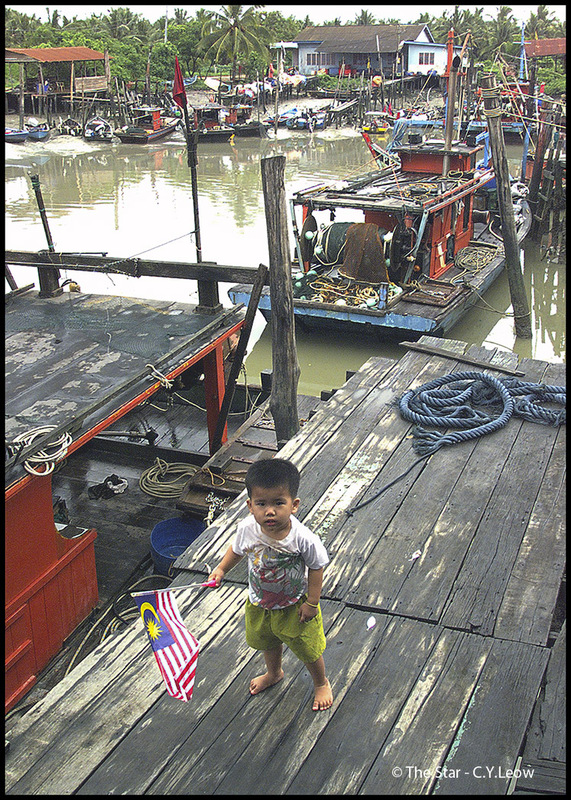 Waving the Malaysian flag, this young Teochew boy in the fishing village of Sekinchan in Kuala Selangor is one of the many descendants of Teochews who came to Malaya looking for a better life. 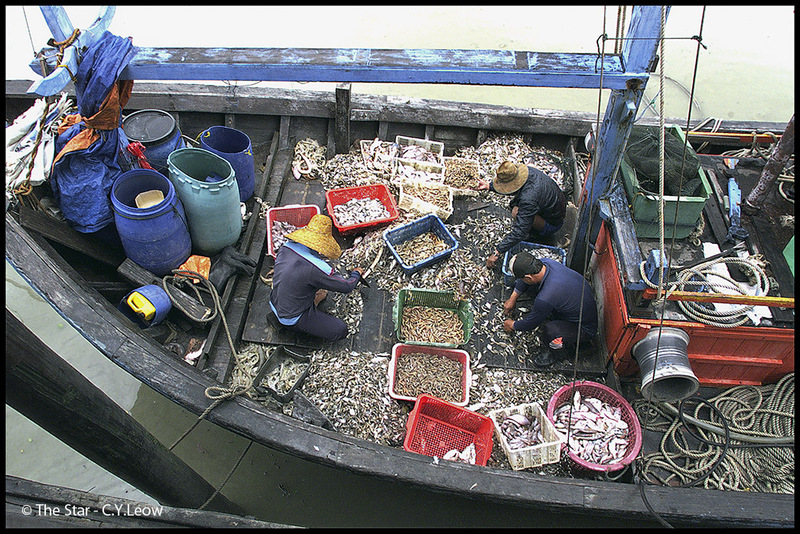 Most Teochews are involved in the fishing industry which was the traditional occupation of their ancestors in Chaozhou, China. 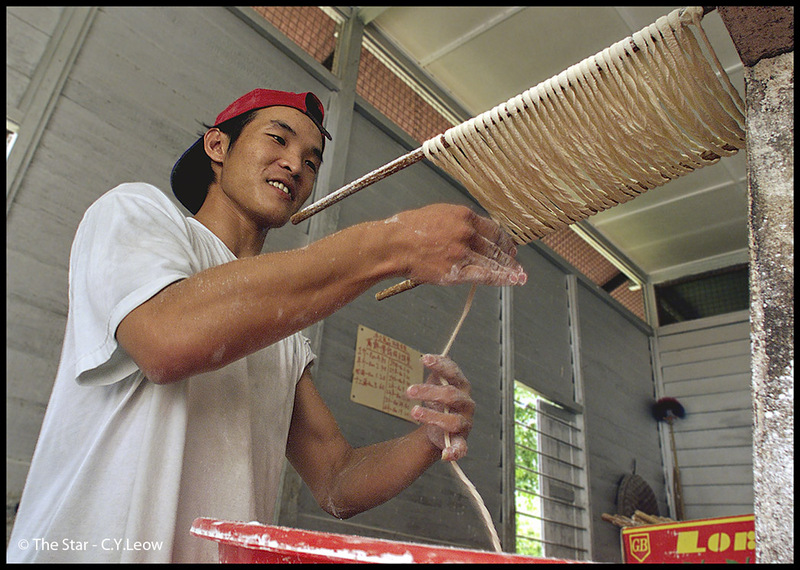 The art of making mien xian, vermicelli-like noodles made of wheat flour, is one of the Foochow's most enduring heritage. Mien xian cooked with Chinese red wine is a staple dish for Foochow women in confinement after giving birth. The Foochows in Malaysia originated from the Fuzhou prefecture in Fujian, South China. Teng Tai Ing learnt the an of making mien xian from his father; their ancestors were noodle makers in the Fuzhou prefecture in Fujian, South China. The Foochow community in Malaysia is small, but many of its members are prominent businessmen and politicians. The main Foochow settlements in Malaysia are in Sitiawan, Perak and Sibu, Sarawak. The Foochows are well-known for their intelligence and diligence. Chilli sauce produced in Kampung Koh, Sitiawan, is famous all over the country. 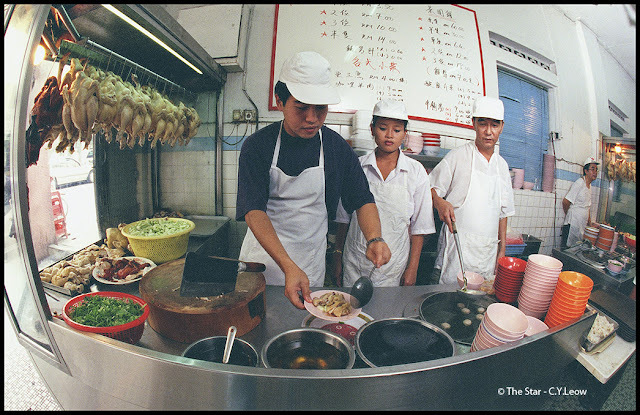 Although the Hainanese were the last group of Chinese to settle in Malaya, they left an enduring legacy with their trademark chicken rice, and culinary excellence. This form of trade began at the turn of the century with itinerant peddlers who bore their wares on shoulder yokes. They appeared wherever workers congregated, offering a refreshing cup of tea or coffee. After a while, these temporary coffee stall, became a meeting point, a place to exchange news while sipping hot drink. When the peddlers had saved enough money, they began to set up permanent stalls. Kopi tiam with its signature marble tables, wooden chairs and cashier counters grew from some of these humble stalls. No one is sure if the Hainanese were the first to set up coffee shops, but they dominated the trade before the Second World War. Coming from Hainan island off the province of Guangdong, they were engaged mainly in the service industry as domestic servants or cooks for Europeans and rich Chinese tycoons. Some opened coffee shops and ran rest houses throughout the peninsula. 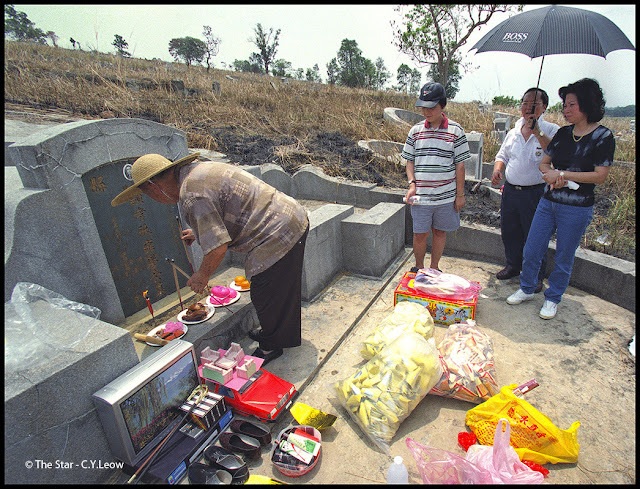 On April 5, the Chinese celebrate Qing Ming, a day for remembering their departed ancestors. Families will clean up their ancestors' graves, pray and give offerings. For filial Chinese. Qing Ming is an important event. On this day, families will visit their ancestors' graves to pray, and give offerings. Food and fruits are usually offered, but some family also "send" cars, television sets, mobile telephones, clothes, and shoes, by burning paper offerings. Prayer papers folded into cups (which resemble the shape of gold nuggets used during the olden days) are burnt to send riches to the ancestors. 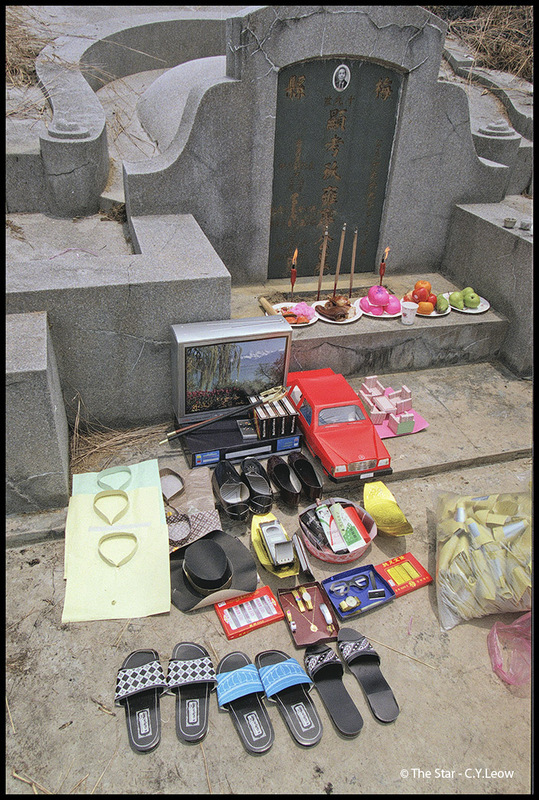 These days, paper offerings have become more sophisticated; paper computers and video recorders are among some of the popular items burnt to ensure that departed ancestors do not miss out on the luxuries of modern life in the hereafter. The Peranakans in the former Straits Settlements of Penang, Malacca and Singapore are defendants of early Chinese settlers who married local women. Their culture is a unique blend of Chinese and Malay influences. The women's traditional costumes of baju kebab and sarong are of Malay origin. 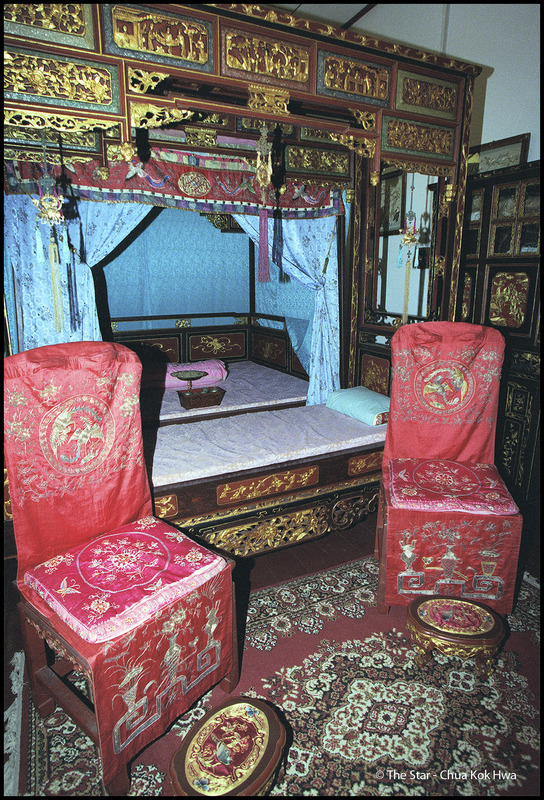 The Baba and Nyonya bridal bed which is called ranging lok san. Following age-old custom, a boy from a good family is asked to roll on the bed before the wedding to ensure the birth of a son. On the happy occasion, the bed is usually brightly decorated. The two seats are for the bride and groom. 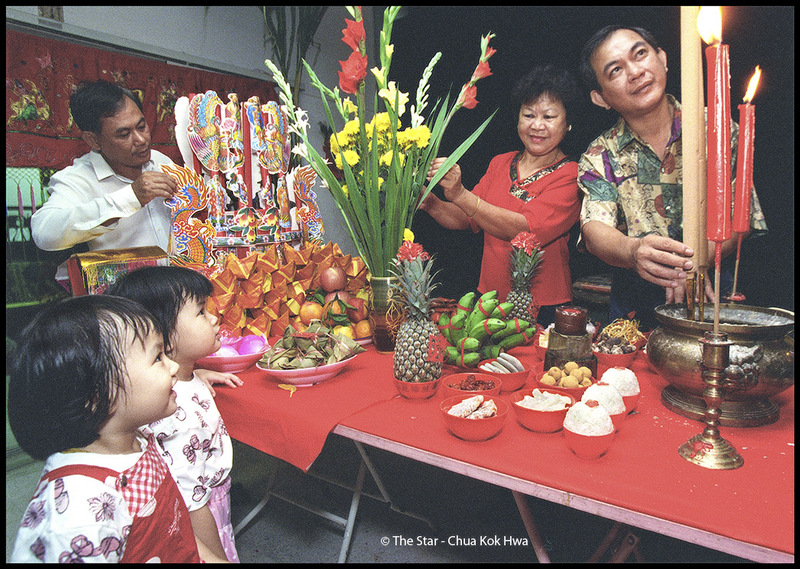 The Nine Venerable Sovereigns' (Kiu Ong Yah in Hokkien) festival begins on the first day of the Ninth Lunar month, and lasts for nine days. During this period, it is believed that the Kiu Ong Yah will visit the various temples and shrines devoted to these deities. Devotees throng Kiu Ong Yah temples to pray for blessings and luck. The highlight of the Kiu Ong Yah celebrations occurs on the evening of the ninth day when devotees join processions to send off the deities. 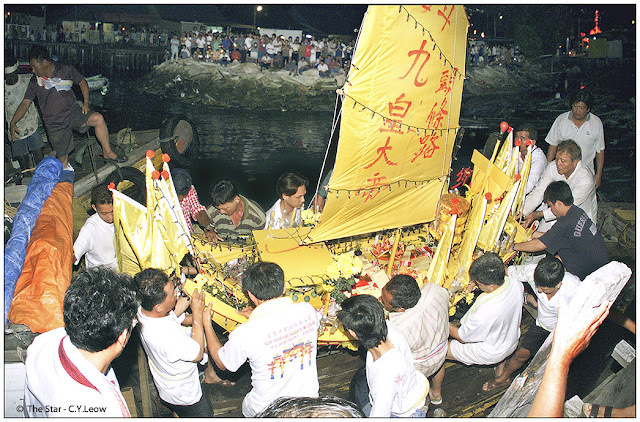 A special boat, conveyed in a decorated chariot, is filled with sacred ashes representing the deities, banners and prayer papers. Each procession passes through an approved route, ending at the nearest beach or shore where a medium will conduct a religious service to send off the deities. The boat is then lowered on the shallow water, set on fire, and allowed to drift away. 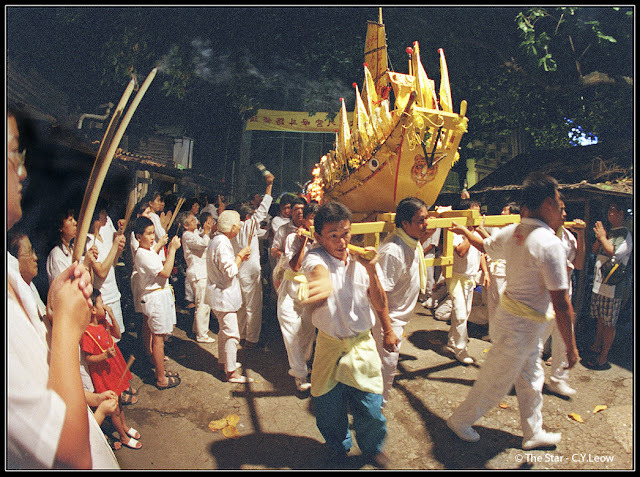 The highlight of the Kiu Ong Yah (Nine Emperor Gods' festival) celebrations is on the evening of the ninth day when devotees join processions to send off the deities in a boat. 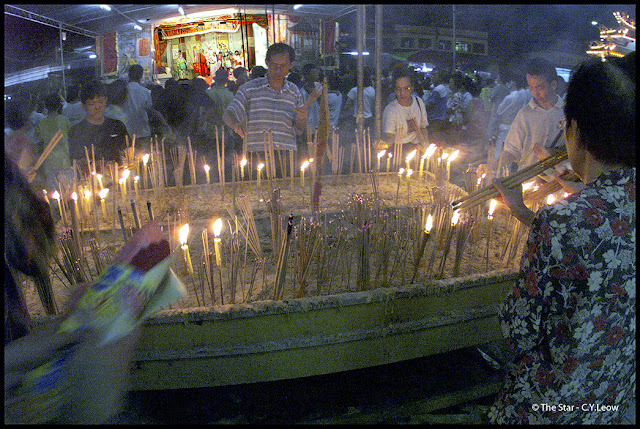 In the night during the Nine Emperor Gods' festival, the Tow Boo Keong temple in Ipoh is crowded with devotees making offerings to the Gods. They used to burn joss sticks which were nearly three metres high and cost about RM1,OOO each. Today, the temple authority has advices devotees to adopt a practical approach by burning ordinary joss-sticks and donating the rest of the money to the temple fund. Once a year, during the Nine Emperor Gods' festival, 500 devotees come to stay at the 102-year-old Tow Boo Keong temple in Ipoh to purify the body and soul by praying and going on a vegetarian diet for 15 days. Some of these senior devotees have been practising vegetarianism since childhood. When the Chinese first ventured to Malaya to seek employment in the 19th century, clan and surname associations were set up to look after the welfare of immigrants in an unfamiliar land. These associations now play a more cultural, rather than political role. Some, such as those in Penang, own sizable property. Lion dance performances are merry affairs as crowds gather to cheer the antics of the "lions". Lions symbolise majestic strength, courage and fortitude, and lion dances are believed to herald in good luck and property. It is usually performed during Chinese New Yeat and for auspicious occasions such as the opening of a new business. Offerings for the altar to honour the Heaven God's birthday on the ninth day of the Lunar New Year are meticulously prepared. The Hokkiens consider this day as the most important and foods offered bear auspicious sounding names to symbolise good tidings. 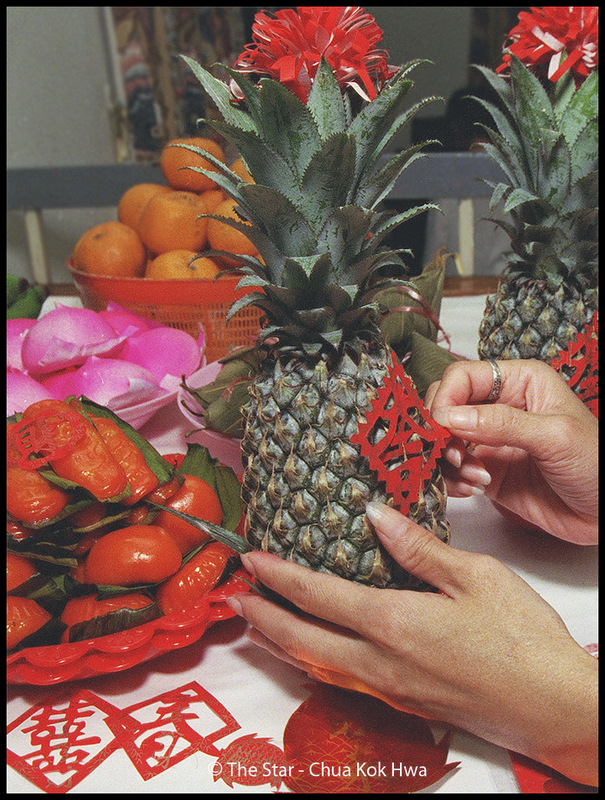 The pineapple, or ong lai (in Hokkien), is a must for its name sounds like the word for prosperity. homes at midnight to give thanks for the past year's blessings and to pray for better fortunes during the Heaven God's birthday. 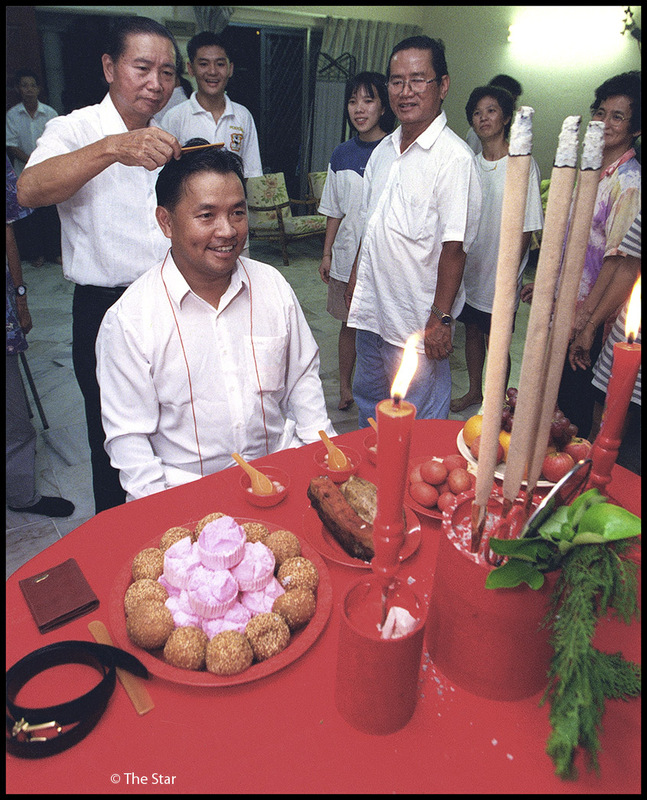 Bridegroom-to-be Raymund Chew goes through the cheo thau (initiation into adulthood) ceremony. In traditional times, every person who intended to get married had to go through this ceremony which was usually performed on the eve of the wedding.Traditionalists believe a person will never attain adulthood until he or she has had his/her hair combed during the ceremony which also involves giving offerings to ancestral gods. Attired in white, the person to be initiated sits facing a table on which are placed several things, including food, which are all significant for life after marriage. A master of ceremony then combs his hair three times. As he sweeps the comb through the hair, he recites verses wishing health, fortune and happiness for the person to be initiated. The practice, however, is now becoming less popular as Chinese families accept more modern and simpler wedding rites. Longevity bun or mu gu (which literally means wheat turtle) is a must for celebrating Chinese religious festivities. 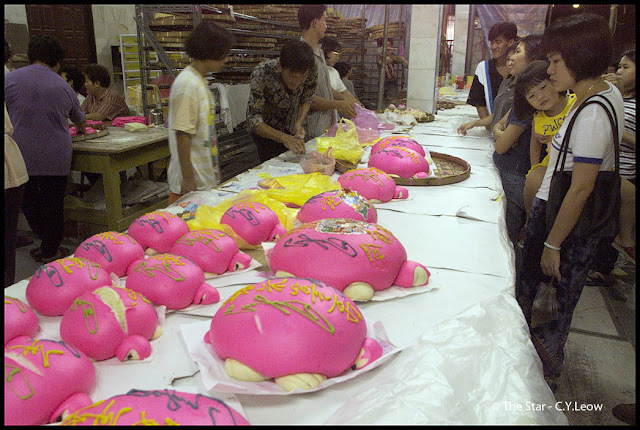 Shaped like a turtle complete with head and four legs, these pink buns are especially popular for birthday celebrations as they symbolize longevity. Yuan, little marble-sized glutinous rice balls, are made to celebrate the Winter Solstice, or Dong Zhi, on the 11th lunar month.In ancient times, the Chinese regarded this as the New Year. The round yuan also symbolizes unity in the family. This completed the section on Chinese community. Wow that is a really good read about Chinese community in Malaysia. Feel ashamed I don't even know my own race. Thank you!